Poi calabash made by plaiting hala leaves? 1869. Lau Hala Poi Umeke (Calabashes).—In Palolo Valley which is ever moistened by the patter of the Lililehua rain, there was held a small feast of pig there on this past Saturday by parents who regularly celebrate the birthdays of their child. At the party, there were also present visitors from town, and when the table of food was being prepared, umeke made out of woven lau hala were brought and placed at the front of the table. From these new type of calabashes did they eat heartily until full. 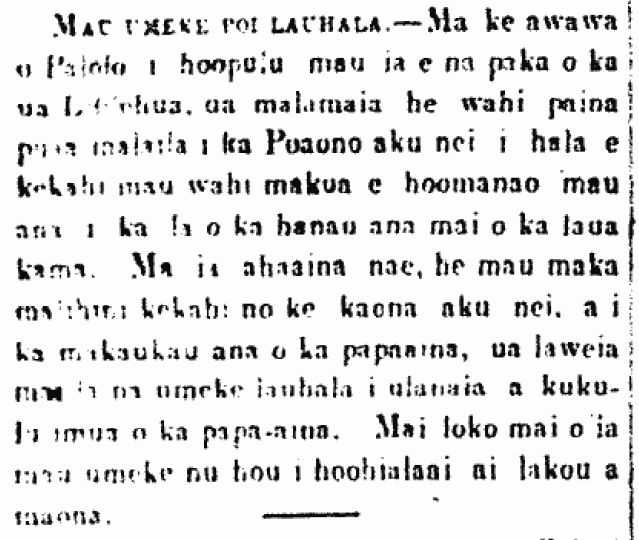 Ka Nupepa Kuokoa, Buke VIII, Helu 15, Aoao 3. Aperila 10, 1869. Poi description in English. 1909. The learned Hawaiian lexiographer [lexicographer] do not give the exact meaning of the word. Poi is a name given to mashed Kalo, potatoe, breadfruit or banana. The Kalo (a species of arum ex-culentum [arum esculentum] when cooked, is mashed or pounded with a stone, especially made for that purpose, until it becomes like a good soft (flour) dough. From that stage it is then reduce to what is called—poi. It is only at this stage the word poi is used. When the taro is merely mashed, or pounded into a hard pulpy mass, it is called a pa’i-ai or pa’i-kalo. When it is reduced to a still softer condition, and could be twisted by fingers, it is then called poi—whether hard or soft (poi paa or poi wali). When the poi is too soft, it is called poi hehee. Our kanaka savant ventures to give his definition of Poi. He thinks that it primarily means to gather up; to collect, to pull up; to hold or lift up an article, lest it falls down or spills over. It is analogous to the word Hii, “to lift up; to carry upon the hips and support with the arms, as a child.” An expert poi pounder will call the attention of an unskillful person when pounding taro, saying: “E poi mai ka ai i ole e haule mawaho o ka papa.” (Gather up the ai (foot [food]) lest it falls over the board). He found a French definition of the word “poi” in Boniface Mosblech’s “Vocabulaire Oce’anien—Francais, et cetera, (Paris, 1843) to wit: “boullie de taro” (soft taro). That does not give the derivative definition of the word (kalo) any better than Mr. Andrews. In conclusion we add the old legend pertaining to the origin of Kalo (taro). Kuokoa Home Rula, Buke VII, Helu 1, Aoao 1. Ianuari 1, 1909. 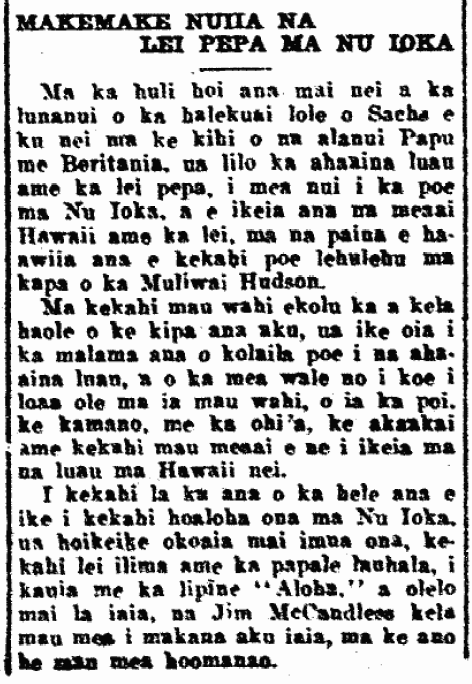 Poi and Kalo and a self sufficient Hawaii, 1915. THE TIME WILL COME WHEN POI WILL BE SCARCE. It would appear that the days are numbered, and 5 pounds of poi will go for a quarter, that is five cents per pound. This rise in price of poi is due to the lack of kalo, and perhaps because Hawaiians just don’t care to plant kalo in their fields. These days in Honolulu, there are but few places that plant kalo. Places that loi kalo were seen are now dried out because the lands were accrued by other groups of people, and they dried the fields out; whereas it would be more beneficial if those back turners continued the planting of kalo. It has been almost two years since this spokesperson [the newspaper Ke Aloha Aina] first advised those with lands to farm them, for the time will come when there will be food shortages, at that time, America will declare war against Germany, which will intensify the problem, and that time we spoke of has come indeed. As proof of what we say, look to the issues of A. D. 1915–16, and you will find our words of advice, strongly encouraging Hawaiians to plant kalo and other crops, because the time will come when there will be hardships, and it will come, without fail. Something terribly astonishing to us is that it as if kalo is being made into poi outside of Hawaii, for the cost is rising like goods imported here. Why is this so? Because there is so little kalo being farmed, and there are a lot of people eating poi. These days, there are other ethnicities eating poi because their staples are expensive, and therefore, many people are eating poi and not much kalo is being planted. We give our appreciation to the poi association of the stevedores which took some kalo lands and leased them out long term to plant kalo to supply their outlets at the markets and feed the poi-eating public. Probably the public doesn’t realize that these days there is a poi shortage; maybe they continue to assume that poi is as usual. No! There is less poi now; six and a half pounds for a quarter, and some weeks it is just six pounds and sometimes five pounds for a quarter, which is five cents per pound. So all you people with some kalo land, you should plant a lot of kalo and pull up well-developed corms when the time is right. Neglect during the day will leave you without. Work while the sun is up. Ke Aloha Aina, Buke XXII, Helu 36, Aoao 4. Sepatemaba 7, 1917.